Dosa is a common breakfast item in a Tamilian household. Dosa can be made crisp (முறுகல் தோசை) or thick and spongy. 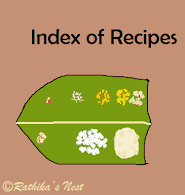 You can also make ghee roast (நெய் தோசை) or masala dosa (மசாலா தோசை). You can further add variety by making vegetable dosa (காய்கறி தோசை). Vegetable dosa is nutritious, tasty and filling. Of course, you can make the humble dosa very interesting to your child. Just use your creativity to make different toppings for dosa such as vegetable combos, paneer, fruits, nuts etc. How to prepare the batter: Click here to find out how to make dosa batter. How to prepare the topping: Chop onions and green chillies finely. Wash carrot and ginger, and grate them using a fine grater. Chop coriander leaves, curry leaves, capsicum and cabbage finely, wash well and drain. Mix all the ingredients with required salt. Let it stand for 10 minutes. How to prepare dosa: Mix the batter well before using. Heat the tava on medium flame. Once ready, spread the batter evenly on the tava, making it 2-3mm thick. Sprinkle the toppings over the dosa covering the entire surface. Add oil around the dosa and allow it to cook for a minute. When cooked, bubbles will appear on the surface and the edges will turn golden brown. Now, turn the dosa over and cook for a short while. Remove from the tava and serve hot with chutney and sambar. Vegetable dosa tastes great with coconut chutney.